nuclear power a viable economic option. Otherwise, a nuclear power renaissance seems unlikely." 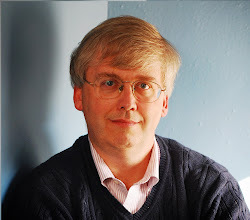 Federation of American Scientists has a report out on The Future of Nuclear Power in the United States, edited by Charles D. Ferguson and Frank A. Settle. The most recent issue of the Economist magazine (March 10) has a 14-page cover story on "Nuclear Power: The Dream that Failed." Finally, a Report to the Secretary of Energy by the Blue Ribbon Commission on America's Energy Future was released in late January. Here is some basic background from Davis in his JEP article. 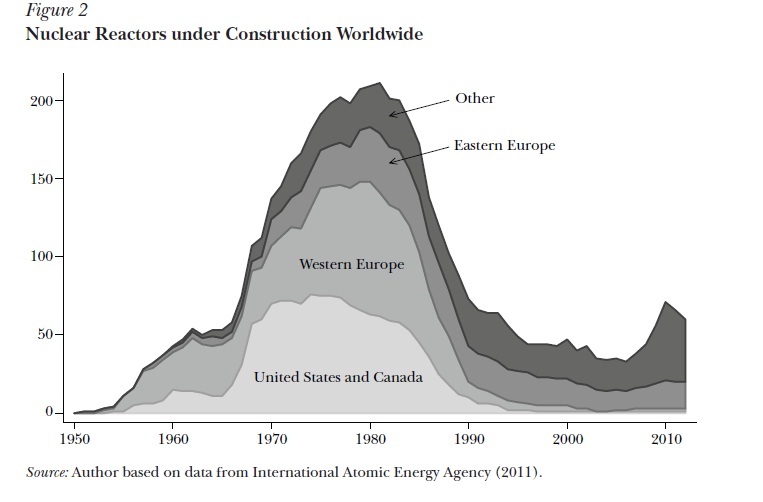 The first figure shows nuclear power plants under construction around the world. Notice that the plants under construction in the United States and western Europe dropped off to near-zero in the 1990s. The recent spike in plants under construction is driven by the "other" category, which is largely China, but it remains to be seen how many of these plants will end up being completed. 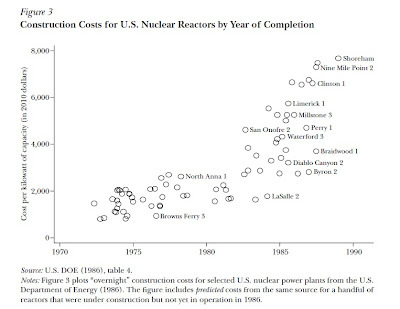 The next figure shows rising costs of constructing nuclear power plants in the United States. The costs are per kilowatt-hour of capacity, and so adjusted for size. The costs are also adjusted for inflation. Finally, this figure shows the slowdown in construction times--for example, plants started in the 1960s were completed in 8.6 years while those completed in the 1970s took 14.1 years. Moreover, there was growing uncertainty as to whether a nuclear power plants would be completed: 89% of plants announced in the 1960s were completed, compared with only 25% of those announced in the 1970s being completed. Of course, it's not possible to separate cleanly the safety concerns over nuclear power from these cost issues: additional safety precautions--and the accompanying paperwork--are part of what drives up costs. But perhaps the more fundamental story here is that technological progress in nuclear power hasn't been increasing fast enough to assuage concerns about safety and to drive down costs. Stephen Maloney digs into this in some detail in Chapter 2 of the FAS report, "A Critical Examination of Nuclear Power's Costs." "Since the nuclear industry’s inception more than 50 years ago, its forecasts for costs have been consistently unreliable. The “first generation” plants, comprising both prototype reactors and the standard designs of the 1950s-1960s, failed to live up to promised economics. This trend continued with the construction of Generation II plants completed in the 1970s, which make up the present nuclear fleet. "First, the total costs were far higher than for coal-generated electricity. In particular, the capital cost of nuclear plants built through 1980 were, on average, 50 percent higher than comparably-sized coal-fired plants, adjusting for inflation and including backfits to meet Clean Air Act standards. Second, there were extraordinary cost escalations over the original low cost promises. Nuclear plant construction costs escalated approximately 24 percent per calendar year compared to 6 percent annual escalation for coal plants. Third, the economies of scale expected were not achieved in the Generation II designs. The scale-up of nuclear plants brought less than half the economic efficiencies projected. safety standards. The combined effects doubled the quantities of materials, equipment, and labor needed, and tripled the magnitude of the engineering effort for building a nuclear power plant." "In June 2006, a consortium of companies announced plans to build two more reactors at the South Texas Project site for an estimated cost of $5.2 billion. NRG, the lead company, made history by becoming the first company to file an application with the NRC. CPS Energy, a municipal utility, was one of its partners. In October 2007, CPS Energy’s board approved $206 million for preliminary design and engineering. In June 2009, NRG revised the estimate to $10 billion for the two reactors, including finance charges. A few weeks later, this estimate rose to $13 billion, including finance charges. Later that year, the estimate reached $18.2 billion ..." Cost overruns of similar magnitude aren't just a U.S. phenomenon; for example, they also have occurred at recent nuclear power projects in France and in Finland. "An academic reactor or reactor plant almost always has the following basic characteristics: (1) It is simple. (2) It is small. (3) It is cheap. (4) It is light. (5) It can be built very quickly. (6) It is very flexible in purpose. (7) Very little development will be required. It will use off-the-shelf components. (8) The reactor is in the study phase. It is not being built now. On the other hand a practical reactor can be distinguished by the following characteristics: (1) It is being built now. (2) It is behind schedule. (3) It requires an immense amount of development on apparently trivial items. (4) It is very expensive. (5) It takes a long time to build because of its engineering development problems. (6) It is large. (7) It is heavy. (8) It is complicated." Finally, arguments over appropriate disposal of nuclear waste will surely continue. For an overview of these issues, a useful starting point is the Report to the Secretary of Energy by the Blue Ribbon Commission on America's Energy Future that was released in late January. Personally, I didn't find the Commission report to be especially encouraging about resolving these issues. For example, the first recommendation is to start a process of encouraging communities to volunteer for being nuclear waste disposal sites, which they think might take 15-20 years. Having just watched the argument over a possible repository at Yucca Mountain in Nevada run for 25 years, before the decision of the Obama administration to halt that process, this time frame seems optimistic. Of course, there are alternatives: consolidated storage facilities, and technologies for processing nuclear waste. But the alternatives aren't cost-free, either. Nuclear power isn't going away. Plants that have been working well still have several decades to run, and the marginal costs of running them are now low. Additional nuclear power plants will be built in countries where the government makes it a priority, or perhaps in some settings where other sources of power are extremely high cost. But as the U.S. enters what seems to be a time of cheap and plentiful natural gas, building a substantial number of new nuclear power plants in this country seems highly unlikely.